Tat Thang Vo Doan, the first author on a paper about this cybernetic insect appearing in the journal Soft Robotics said that “For a disaster scenario, we could release hundreds of cyborg insects to the site ... Once an insect detects a victim, it will send an alarm to the rescue team. I know that it sounds like science fiction, but we are in fact working to realize it.”, when asked about how these cyborg insects be controlled in a disaster scenario. Imagine when you have hundreds of beetles flying towards you, but instead of real beetles that may potentially hurt you, these are living insect-machine hybrid robots that are sent to rescue you when you’re in a tight position. How cool would that be? Well, that might just happen in the future because researchers from Nanyang Technological University recently worked on a paper entitled, Controllable Cyborg Beetles for Swarming Search and Rescue.There have been researches in the past about flying insects, however, this new cyborg beetle is said to be the smallest and the easiest to control yet. This particular beetle is based on the Darkling beetle which is about 2 to 2.5 centimeters small and weighing about 0.5 grams. Also, this bug has a lifespan of about three months or more. A backpack of electronics interfaces with the beetle’s antennae and the beetle’s escape mechanism activates when the antennae are stimulated with an electric pulse resulting in a reaction that will make it think it is running into something causing it to turn.The beetle itself is still the one controlling its arms and legs, so much so that it can respond to high-level controls with adaptive gaits and such, making it a lot easier to control. 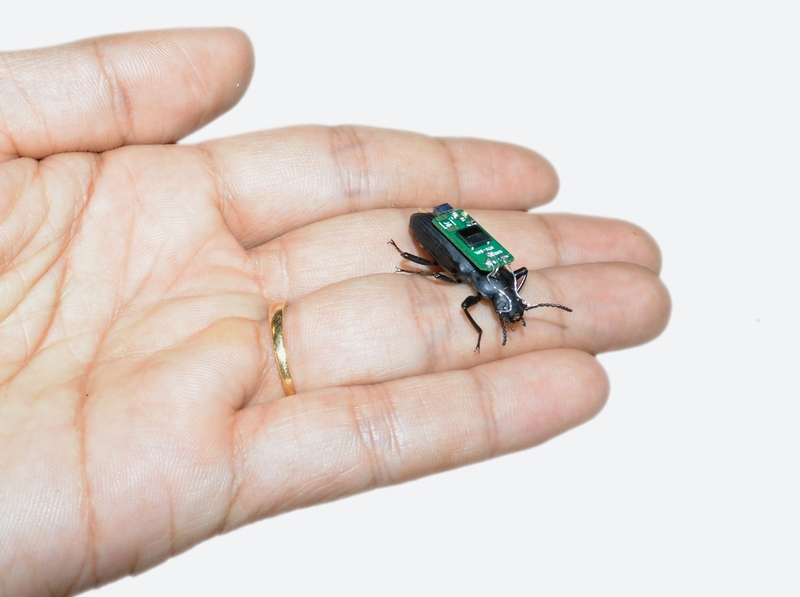 This cyborg beetle can be controlled for 8 hours with just two coin cell batteries, long enough for it to travel over a kilometer with the average speed of 4 centimeters per second.For you to effectively control an insect using these methods, the key is that the response to the antenna stimulation can’t be binary. The researchers modified how sharp of a turn the insect took by changing the frequency of stimulation. When they increased the stimulation frequency, the insect’s turning rate also increases, with a success of more than 85 percent. Stimulating both antennae at once will cause the cyborg beetle to back up, and by default it will move forward, which gives you just about as much control that you want.As of this moment, the ultra lightweight living legged robot is still in development and would hopefully be used in real life applications in the near future.Want to know more about this awesome device? Then follow this link!